I am saving my cream quota for the next post so this luscious soup recipe has no cream or butter whatsoever. Hooray for another dairy free and vegan friendly recipe! Lately, I have really been interested in cooking vegan friendly food. I love my self-imposed cooking challenge especially coming from a person who does not have any strict dietary requirements. When I tried to cook with only plant based ingredients, it allows me to explore new combination of ingredients. Legumes generally add heartiness to a meal.. Instead of a carbohydrate centric soup, it’s exciting to incorporate a little protein to make a satisfying meal. As the sweet potato and chickpea are fairly versatile to work with in terms of flavour, I have added curry powder as my flavour base but Thai curry paste, Moroccan spices or dried Italian herbs will work just as well. In a pot, add cooking oil. When the oil is hot, sauté the diced onion until translucent. Add curry powder to the onion. 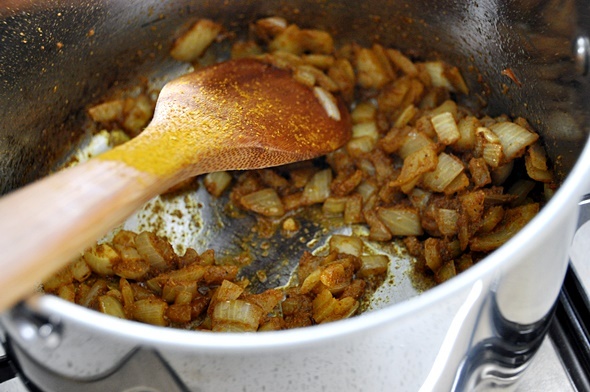 Sauté until aromatic and oil is slightly separated from the mixture. Add a splash of water if the mixture begins to stick to the pot. Add sweet potato and chickpeas. Stir until everything is well combined. Add vegetable broth. Turn the flame to high until boiling and reduce to flame to low-medium. Cover with a lid and allow the soup to cook until the sweet potato is mashable. Using a stick blender and blitz the mixture until creamy and velvety consistency. Return the soup to the stove and simmer over low heat. Do a taste test if additional salt is required. When it is bubbling, the soup is now ready to serve. 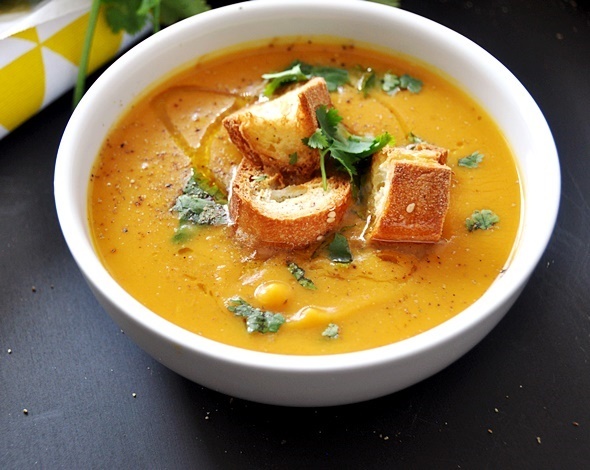 Serve the soup with freshly milled black pepper, chopped coriander and topped with croutons. I love that you appreciate vegan cooking, even though you aren’t doing the whole strict lifestyle. And I liked your gentle language, regarding the flavor and spices. You didn’t sound like some rigid food snob. Mas props!! Thank you. This has become a crock pot soup staple. 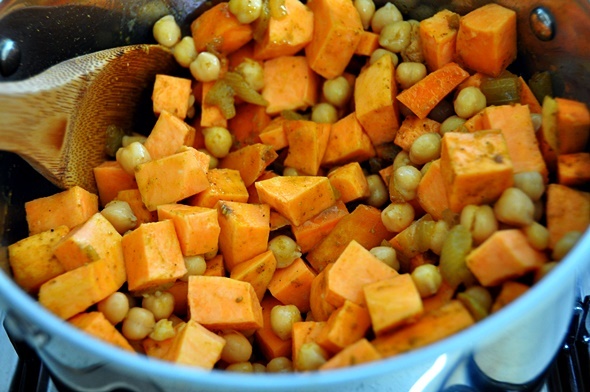 Sweet potatoes, chickpeas and curry. Great trio of flavors along with the other ingredients. Hey Emily, thanks for posting this recipe. I love that it’s simple and nutritious. 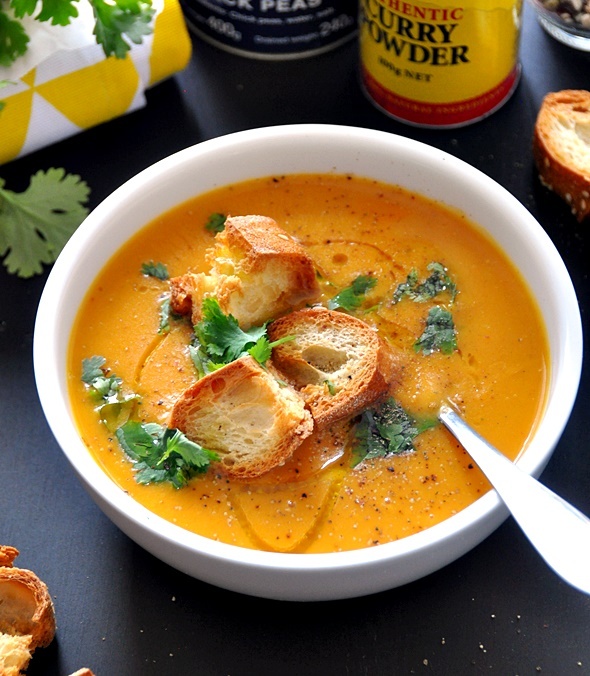 Making soup is one of my favorite things so I’m looking forward to making this one.